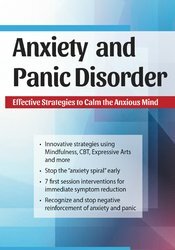 Do you want to gain powerful techniques for your clients who struggle anxiety and panic disorders? Learn how to assess anxious habits, symptoms and behaviors using effective cutting-edge, evidence-based strategies…even with your toughest clients! Dianne Taylor Dougherty will teach you how to stop the anxiety spiral early to significantly reduce the severity and frequency and anxiety symptoms. Experience how evidence-based treatments can help your clients problem solve, reduce tension, and increase energy. Learn unique, effective approaches to mindfulness, cognitive therapy, and exposure, including thought-labeling, interoceptive exposure, and better-but-believable thoughts. Case studies, role plays, demonstrations and interactive discussions will be utilized in this cutting-edge recording. Differentiate diagnostically between anxiety and panic disorder in order to improve client assessment and treatment planning. Evaluate the relationship between trauma and anxiety disorders; utilize this information to better inform choice of treatment interventions. Explore the inverse relationship between anxiety and problem solving; utilize cognitive therapy tools to integrate problem solving skills into the client’s treatment plan. Compare the five types of anxiety and develop appropriate treatment interventions for each type. Apply mindfulness skills, including mindful labeling and observation, to treat symptoms of anxiety and panic disorder. Utilize clinical strategies derived from expressive therapies in order to reduce anxious symptoms and increase energy and awareness in clients. Progressive muscle relaxation, breathing exercises, subtle yoga, expressive writing, and more! Dianne Taylor Dougherty, MS, CAGS, LPCS, has over 20 years in private psychotherapy practice with a concentration in anxiety and depression. She is the author of two works on the subject: AT EASE: Treating Anxiety Disorders and Priming the Pump: Expressive Writing for Anxiety and Depression. Dianne embraces an asset-based philosophy to treatment which incorporates CBT, Rational Emotive, Mindfulness, and Expressive Arts therapies to promote individual healing. Dianne is also a certified practitioner of Mindfulness Based Stress Reduction, having received training from Duke Integrative Medicine in this modality. In addition to her anxiety work, Dianne teaches nationally and internationally on the topics of Expressive Arts in Therapy, Clergy Sexual Abuse, Trauma Recovery and more. She is the author of Treating Divorce as Trauma© (2001); Multidisciplinary Treatment for Clergy Sexual Abuse© (2005); The Creative Personal: A Guide for Mental Health Counselors to Incorporate the Expressive Arts in Therapy© (2009); Priming the Pump: Expressive Writing for Health and Well-being© (2013). Financial: Dianne Taylor Dougherty is in private practice. She receives a speaking honorarium from PESI, Inc. Non-financial: Dianne Taylor Dougherty is a member of the American Mental Health Counselors Association; and North Carolina Counseling Association. PESI, Inc. is an AOTA Approved Provider of continuing education. Provider #: 3322. This self-study course qualifies for 6.0 self-study contact hours or .6 CEUs in the Category of Domain of OT and Occupational Therapy Process. The assignment of AOTA CEUs does not imply endorsement of specific course content, products, or clinical procedures by AOTA. Course Level: Intermediate. Expires: 1/8/2021. PESI, Inc. designates this self-study activity for a maximum of 6.0 AMA PRA Category 1 Credit(s)™. This activity was originally recorded on 01/08/2019. It was last reviewed on 09/02/2018 and is valid until 09/02/2021.